Photo: John. G. Lund House (Lund-Hoel House), ca. 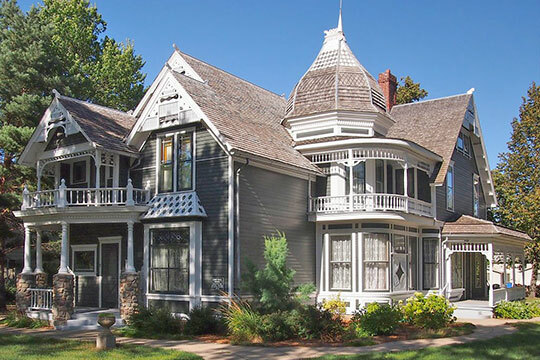 1891, 101 West 4th Street, Canby, MN. Listed on the National Register of Historic Places in 1986. Photographed by user:McGhiever (own work), 2013, [cc-by-3.0 (creativecommons.org/licenses/by/3.0)], via Wikimedia Commons, accessed May, 2015. Yellow Medicine County Courthouse is located at 415 9th Avenue, Granite Falls MN 56241; phone: 320-564-5841. Established March 6, 1871, the county is crossed by the Yellow Medicine River whence the name is derived. It is a translation of the Dakota or Sioux name, which Professor A. W. Williamson spelled and defined thus: "Pajutazz (Pezhihutazi, abbreviated from Pzhihutazizi kapi), — peji, generic name including grasses and all other erect plants without wood stems; huta, root; zi, yellow; kapi, they dig; diggings of yellow plant root, or yellow medicine diggings; the Dakota name of the Yellow Medicine River, written by Nicollet Pejuta zizi. The name as first spelled was given by Dr. T. S. Williamson to his station, and is found in this form on a number of maps." It was proposed in 1878-9 to establish a new county, named like the village and city of Canby, in honor of General E. R. S. Canby, whose biography is presented in the notice of that city. The legislative act for this purpose, subject to ratification by the people, received the governor's approval in February, 1879. The proposed county was to comprise the western six townships of Yellow Medicine County, the three most northern of Lincoln county, and three from southwestern Lax qui Parle County. The vote in Yellow Medicine County was 463 yes, 370 no; but the vote in Lincoln County defeated it. Upham, Warren, Minnesota Geographic Names: Their Origin and Significance, Minnesota Historical Society, Saint Paul, 1920.